During the holiday season last week a group of Callibra, Inc. dba Discharge 1-2-3 employees helped the organization Feed My Starving Children (FMSC @fmsc_org) prepare meals for hungry children at the FMSC facility in Schaumburg, IL. 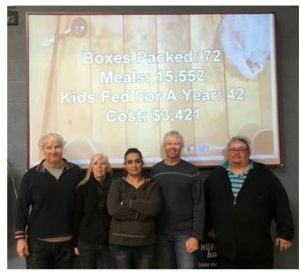 While they were there, the Discharge 1-2-3 employees with fellow volunteers packed a total of 72 boxes containing 15,552 meals – enough to feed 42 children for a year. Callibra also made a financial contribution. Founded in 1987, Feed My Starving Children is a Christian non-profit that provides nutritionally complete meals specifically formulated for malnourished children. Donations to FMSC are used to procure ingredients, which are then combined into meal formulas and packed by volunteers. FMSC partners with organizations and ministries in 60 countries to distribute the special meals to children in need. To learn more about Feed My Starving Children, or to make a contribute, visit https://www.fmsc.org/.